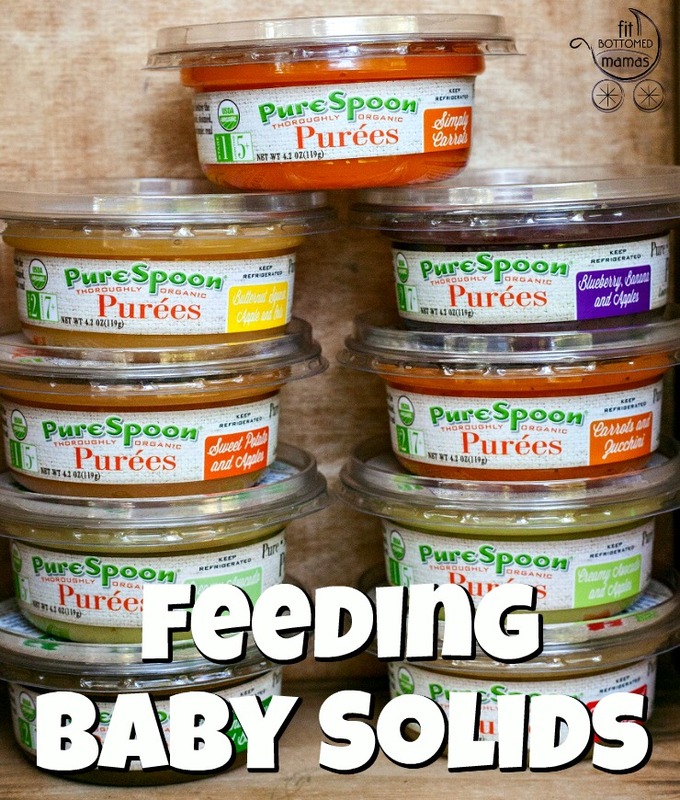 In yet another example of “never say never” or “never say always” as a mom, when my baby was four months old, I swore that I wouldn’t give her solids until six months. I’d read up on baby-led weaning and how to best introduce solids, breastfeeding was going really well for us (so grateful for that), and Gwen was showing zero interest in solids. I had a conversation with her pediatrician about feeding baby solids during her four-month check-up and how she/I wasn’t ready for it yet, and then — literally — the next day, everything changed. She went from being absolutely uninterested in solids to: GIVE ME ALL THE FOOD ON YOUR PLATE, MOM. From there, we started giving her some mashed sweet potato, then avocado, then some frozen fruits and peas in those reusable mesh bags. And she gobbled them up. Soon we were on to Cheerios, small pieces of salmon, cooked carrots, sauteed kale, green smoothies, deconstructed chili and taco salad — basically anything we ate that wasn’t crunchy and/or that we could break down into smaller bites, she ate. And eating was kind of her superpower. 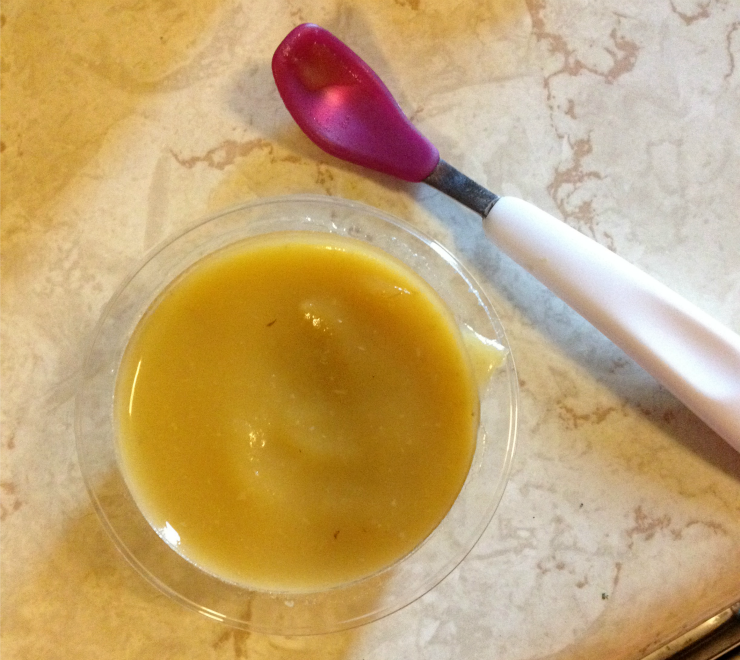 In those early months, we didn’t really do any traditional baby food at all. We did do some food pouches (and still do — so convenient), but girlfriend wasn’t a fan of taking a spoon of food. She wanted to do it all herself. It was all about having fun with food, eating with mom and dad, and working really hard to perfect that pincer grasp. Later came the sippy cup. 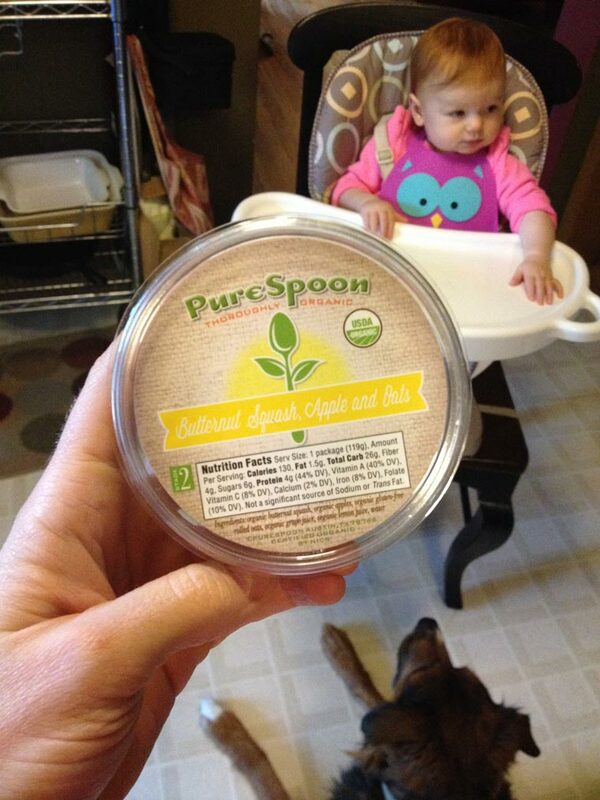 And now that she’s 10 months old, we’re working on having her feed herself with a spoon — which is a process. Like anything with baby. So much exciting stuff to learn! And some of those foods we’re having fun playing with are Greek yogurt, spoonfuls of green smoothies and Pure Spoon purees. Made from fresh, certified organic produce that’s raw or lightly steamed, I tasted them, too, and they were delicious. Creamy, full of flavor and a little sweet but not overly sweet. Not to mention how convenient it is to just have healthy food ready and waiting for her in the fridge at all times. It’s funny, Pure Spoon sent these probably thinking that we’d be at the point of spoonfeeding Gwen, when it turns out, she’s actually a big fan of texture and feeding herself! And it all worked out. Just like we say here time and time again, you have to do what works for your family. Every baby is different — and you’re the expert on them!